This blueberry smoothie recipe is packed with fiber, protein, and healthy vitamins! You will love this healthy green smoothie recipe for breakfast or a snack!! This blueberry smoothie is perfect for those hoping to lose a little weight! Since college, I have enjoyed exercising and eating healthy. Of course I love to indulge too, but after putting on some weight when I graduated high school, and then working incredibly hard to get rid of it, I was forced to learn a little bit about nutrition. That’s not to say I eat healthy all of the time, but I try to keep a nice balance. While I used to follow the paleo diet very strictly, I no longer put restrictions on what I can and cannot eat. I enjoyed the paleo diet, but I didn’t like feeling guilty if I are french fries. After years of dieting and reading about different nutritional programs, I learned that most of them have one common thread: protein, healthy fats, and fiber. Protein and fiber are great for helping you feel full for longer periods of time than a meal of carbohydrates. They are also great when exercising, and help build muscle. If you are anything like me, you have a hard time getting enough veggies in. I really hate salads, so those are typically off the menu for me. It is hard for me to get enough fiber and greens in especially during lunch time! Smoothies have been a wonderful alternative for me! I love that I can eat a huge serving of really healthy greens without having to stomach down a salad or serving of steamed spinach. A protein smoothie packed with greens is the perfect way for me to eat healthy without sacrificing any flavor or forcing myself to eat something I don’t really like for the sake of health. I recently purchased a Vitamix blender, and I have absolutely loved using it to make green smoothies in the morning! 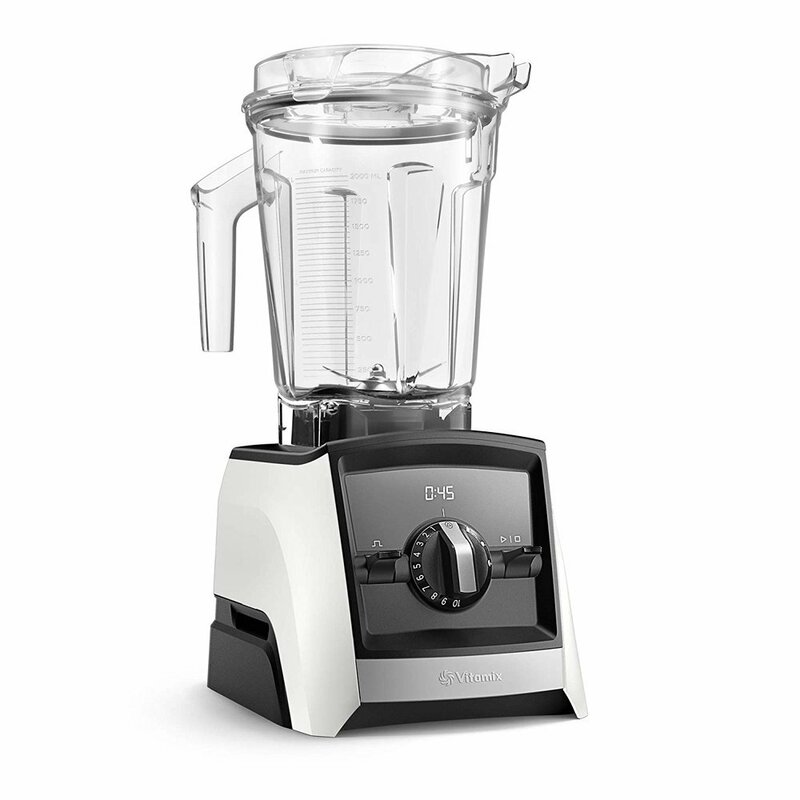 The Vitamix certainly lives up to the hype - I use it at least 4 times a week whether to make smoothies, soups, or purees. It is a great addition to my kitchen! I have been reading the book Body Love from Be Well By Kelly, and have been enjoying it so far! I love all of her smoothie recipes inside! The book is filled with delicious lunch and dinner recipes too, it’s been a great read. This blueberry smoothie is a twist on one of the smoothies from Be Well By Kelly. I have added spinach and cauliflower to take this up a notch. The cauliflower is excellent for adding a creamy texture without adding milk or yogurt! This was a tip from a follower on instagram, and it is genius! You could also add blanched and frozen zucchini for added creaminess (this applies for all soups too!). What is the best protein for green smoothies? There are soooo many different types of protein supplements you can buy. I really enjoy Vega from whole foods, but recently tried Primal Kitchen’s Collagen Fuel protein powder and LOVED it. The vanilla coconut flavor is the perfect addition to this recipe! I like PK’s collagen fuel because it contains 10g of protein and zero grams of sugar per scoop! The added collagen in PK’s powder is a bonus to the protein making this smoothie even better for you! This recipe calls for coconut or almond milk, but you could easily leave it out! It tastes a bit creamier with the milk, but try adding frozen zucchini or cauliflower for added creaminess without having to add milk or yogurt! Cauliflower is anti-inflammatory and contains antioxidants as well as high levels of vitamin C and fiber! Blueberries are known as antioxidant mavens! They help with cholesterol, blood pressure, brain function, and heart disease. This smoothie is completely packed with nutrients and fiber, and adding a scoop of protein will make this blueberry smoothie complete. 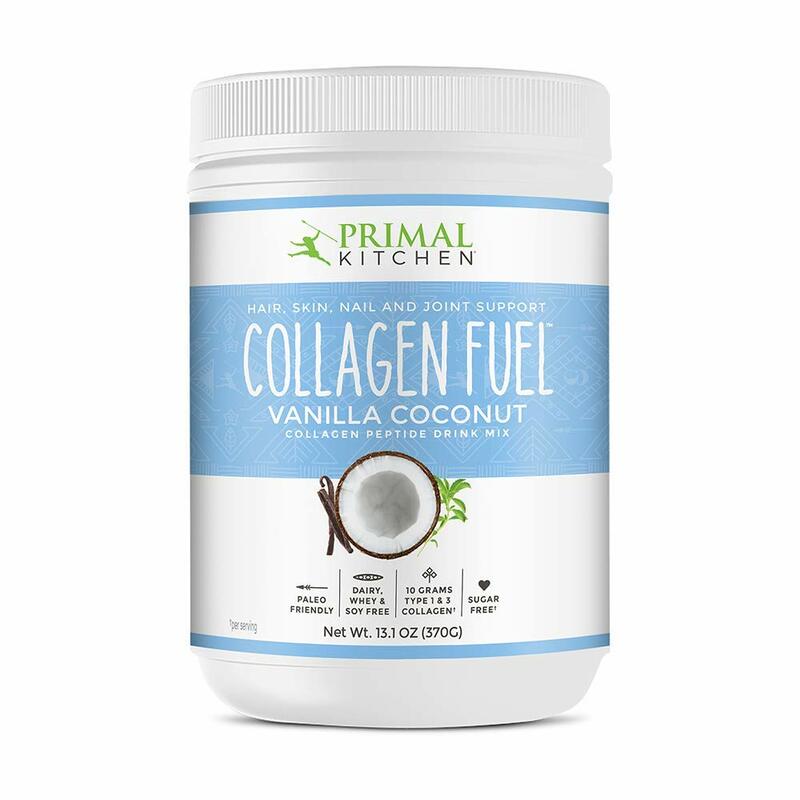 Primal Kitchen’s collagen protein powder supports healthy hair, skin, nails and joints, and promotes muscle repair. Lastly, by adding a scoop of almond butter (or coconut butter) you are adding healthy fats to this blueberry smoothie recipe that will increase the calories and help you feel full longer - and make this the perfect meal replacement. Layer the ingredients in a high speed blender in order starting from the top (so that the liquid is at the base of the blender). Blend on high until the smoothie is at your desired consistency. Stir in more water as needed (I typically need to add about 2 more cups of water). This blueberry smoothie recipe makes 2 large smoothies (perfect for breakfast), or 4 small snack sized smoothies. I like to enjoy a large smoothie for breakfast, and usually pour the rest of the smoothie into a large mason jar for the following day. In the refrigerator, the smoothie will separate, simply shake before enjoying!